Ten years ago, I published my first "IPv4 address use report" over 2005. After that, I did 2006, 2007, 2008, 2009, and 2010. 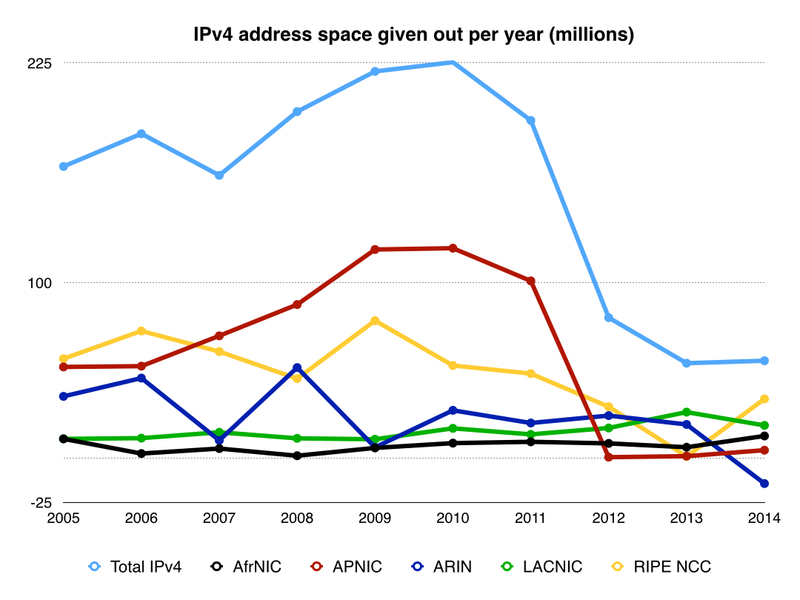 Today, I'm going back to the well one last time and provide an overview of what happened with the IPv4 addresses the past decade, which will close the book on the IPv4 address space as far as I'm concerned. 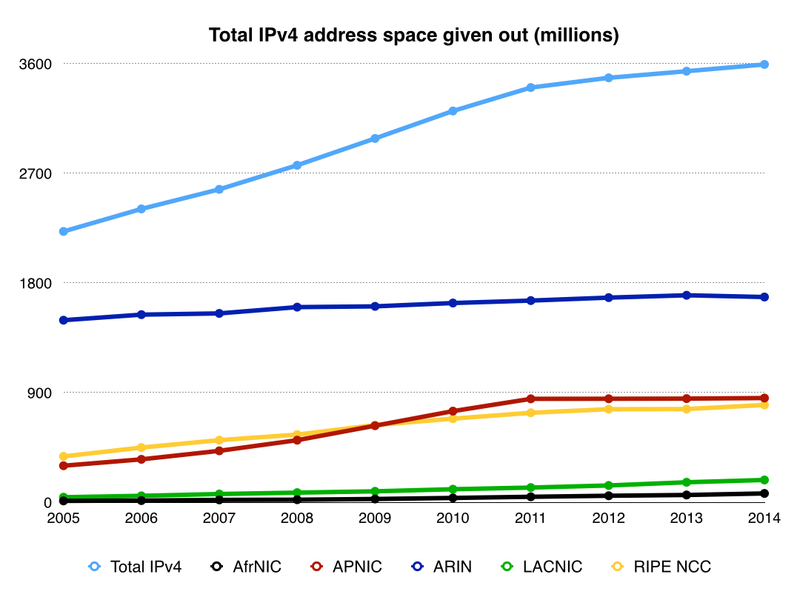 At the end of 2005, 2056.30 million of the 3706.65 usable IPv4 addresses had been given out: 55%. Today, it's 3592.99 million, which is 97%. Can you imagine driving a car with a tank filled to 3%? Or work on a computer with a drive that's 97% full? All the numbers I present here are based on those published on the FTP servers of the five Regional Internet Registries that give out IP addresses. So an address is "in use" if an RIR has given it to an ISP or directly to an end-user organization. Whether that ISP or that organization actually uses the address is something we can't tell from these numbers. Let me first explain the 3706.65 million number. IP addresses are 32 bits long, which means there's 2³² = 4,294,967,296 of them: 0.0.0.0 to 255.255.255.255, or 256 blocks of 16,777,216 addresses that start with the same number. We call one of those a "/8" in the business. 0/8 (or 0.0.0.0/8, which is 0.0.0.0 - 0.255.255.255) and 127/8 can't be used because they each contain one special address. 224/4 (everything starting with 224 to 239) is used for multicast and 224/4 (240 - 255) is "reserved for future use". This prompted some programmers who are a bit too fond of input validation to reject those addresses. As a result, those addresses can't be used on many systems, some of which are no longer updated, but still used. So 268 million perfectly good IPv4 addresses will probably remain unused forever. Last but not least, there's the 17,891,328 addresses set aside for private use: 10/8,172.16/12 and 192.168/16. So the total usable IPv4 address space is 222 × 16,777,216 - 17,891,328 = 3,706,650,624. APNIC and the RIPE NCC have been running on fumes for the past several years: ISPs in their region can only get one last block of 1024 addresses after those two dipped below the 16.78 million address mark (a /8 block). This happened in 2011 for APNIC and in 2012 for the RIPE NCC. This year, ARIN and LACNIC also reached a similar status, although ARIN doesn't use the "one last block" policy. As a result, organizations that need IPv4 addresses now have to buy them from others who can spare some. 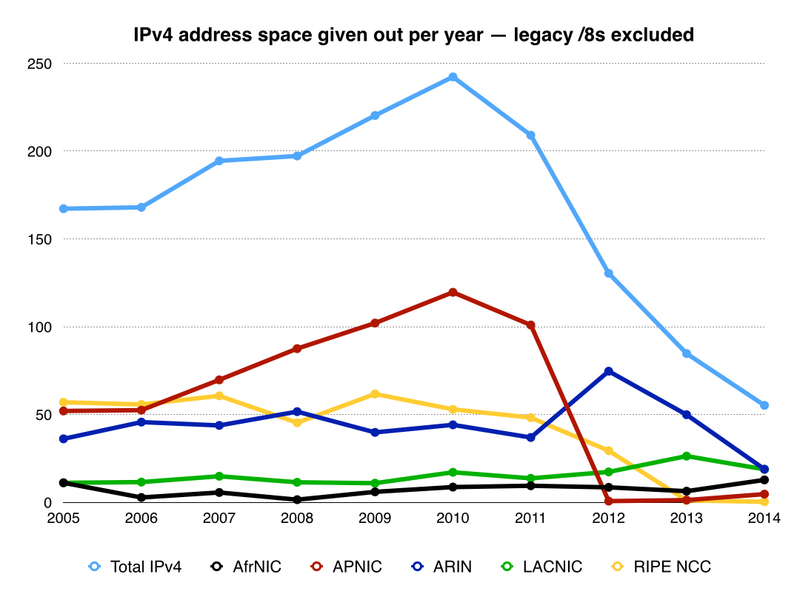 IPv4 address transfers were especially big in the RIPE region in 2014. In the ARIN region, the number of transfers was limited at 180 in five years, but the size of the blocks transferred tended to be large; apparently here transfers were mainly used to get larger amounts of address space than what could (then still) be obtained directly from ARIN. Inter-RIR transfers are now also possible, and happen exclusively from the ARIN region to the APNIC region. 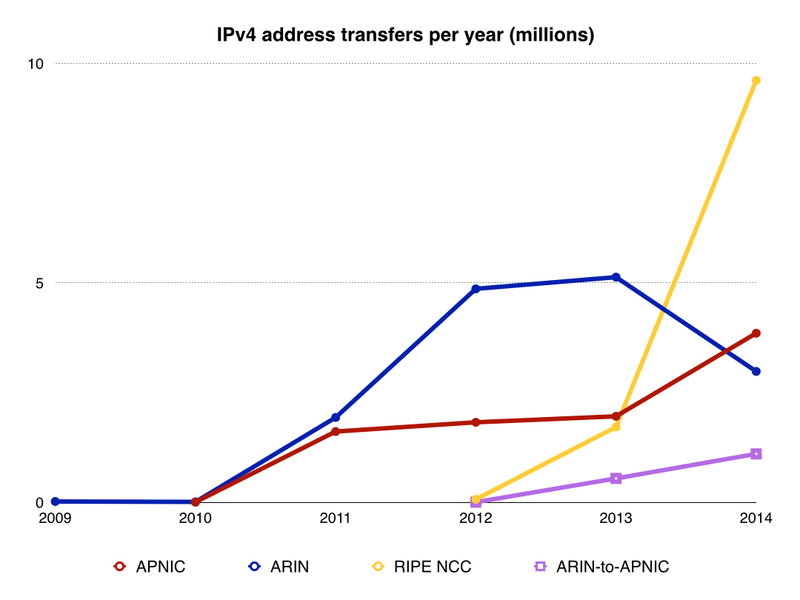 See the RIPE and ARIN transfer statistics on their websites and APNIC's on their FTP server. Surprisingly little has changed, although the BRIC countries have claimed a bigger piece of the pie. I don't know why India has barely a tenth of the number of IPv4 addresses that China has. 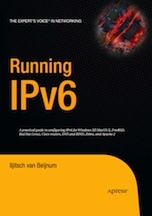 So long IPv4, it's been good knowing you. Comments or questions? Email me.